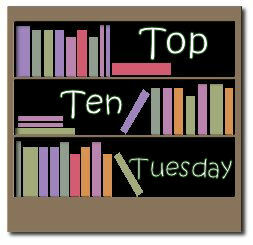 What are your top ten Favourite Book Characters? This is so incredibly hard!! Like Kelly did about choosing her favourite books for the list, I feel like picking between children/pets as to which one is favourite. 1. Peter Pan : I think Peter Pan was one of the first book crushes I ever had, which is why he should come first on this list. I've always wanted to be able to fly and have been fascinated with Never Never Land for as long as I can remember. Peter is such an awesome character who I think represents the child in all of us. 2. Elizabeth Bennett and Mr. Darcy from Pride and Prejudice : I have so much love for Elizabeth because she's a smart female character. She grows up in an almost all-woman household and stands out from the rest of her sisters, not because of her overwhelming beauty (though she is pretty) but because of her character. She's a good daughter, sister and friend to those around her. Plus, though she may be stubborn, she's also able to adjust her view when presented with convincing evidence. "You must know... surely, you must know it was all for you. You are too generous to trifle with me. I believe you spoke with my aunt last night, and it has taught me to hope as I'd scarcely allowed myself before. If your feelings are still what they were last April, tell me so at once. My affections and wishes have not changed, but one word from you will silence me forever. If, however, your feelings have changed, I will have to tell you: you have bewitched me, body and soul, and I love, I love, I love you. I never wish to be parted from you from this day on." Every girl has to admit they'd want a man saying this to her. 3. Sirius Black and Dumbledore from Harry Potter : Sirius is the mysterious bad boy, he's wrongly accused of killing Harry's parents and has suffered extensively for this. Meanwhile, he shows such a great love for Harry and loyalty to his friends that I can't help but love him for this. Besides, I like how he's brave (sometimes foolishly so) and doesn't hesitate to step in when his loved ones are threathened. He stands for what he believes in. And I can't help but picturing as tall, dark and handsome pre-Azkaban. Also: his Animagus is a big shaggy black dog, what's not to love? Dumbledore: he's your favourite grandpa and Santa combined and I love him very much. 4. Juniper from Juniper by Monica Furlong: I've loved this book forever and I really appreciate the female characters all being strong and actually having more power than men. Juniper combines a caring side with enormous strength and she's a sort of role model in that aspect. 5. Kvothe from The Name of the Wind : Kvothe is a character who definitely has some faults, but he learns to overcome them beautifully. I love the voice Patrick Rothfuss has given him and am very anxious to continue his story in the sequel. 6. Rhett Butler from Gone With the Wind : Rhett is mischievous and doesn't let Scarlett get away with any deceptions and untruths she'd like to hide from the world. He sees right through and still loves her for who she is; he accepts her flaws and all. He also shows a very caring and gentle side of himself, which I find very attractive. 7. Arya and Ned Stark from A Game of Thrones : Arya is Ned's daughter and is a genuine tomboy. She doesn't want to dress up and play nice, which sort of reminds me of myself, except for the fact she goes running around with a sword, which I never did. She knows to 'stick 'em with the pointy side'. Ned Stark: or Lord Eddard as he's officially called. He's such a noble man, he believes in honour and truth above everything else and gets himself in trouble because of this, but still he will not back down. I love how he's a great lord and warrior while being a great family man at the same time. 8. Jo March from Little Women : I see parts of myself in Jo (namely the writing part), which is probably why I can relate to her so much. Jo is a lovely girl who cares so much about her family and who is able against odds (like her first manuscript being burned) to write and publish a novel. 9. Katniss Everdeen from The Hunger Games : Katniss is a very strong character, she keeps her family alive during hard times and she fights to the death if that's what it takes to keep herself alive. She's brave and resourceful and shows a soft side in regards to her sister and the girl Rue she meets during the Hunger Games. There's also a stubborn and sometimes unforgiving quality to her I can appreciate. 10. Celaena Sardothien from Queen of Glass by Sarah J. Maas: this one requires some explaining, since the book isn't published yet, but will be late 2011. I used to read a lot of stories on Fictionpress.com and this was one of them (it's not on the site anymore because of pending publication). Queen of Glass is a Cinderella retelling with a twist: Celaena isn't a damsel in distress but a very successful assassin. She's fiercely protective, very strong and fights against all odds. She does everything with a passion and I really love her for this. When this one hits the shelves, I'll be the first in line to get a copy. This was such a trip down memory lane! I'm gonna cheat some more and have as honourable mentions: Lyra Belacqua, Mr. Knightley, Gandalf, Aragorn, Jack Jackson, Robin Hood and Gemma Doyle. Haha, we're definitely on the same wavelength, I've got Elizabeth and Darcy on my list, too. Yay for HP, as well. It's so hard to pick a favorite from among such an amazing world of characters, huh? Also, I can't wait to read the Hunger Games. I'm really looking forward to a strong female character in a current YA series. GREAT LIST! I am having such a hard time with mine! I've got 6 people listed so far, and can't seem to think of anyone else! I read at LEAST two books a week, you'd think I'd have a lot longer of a list! Your list is fantastic! I loved thinking about this and writing my thoughts about each character. Thanks for another great top ten list day! ender, from enders game, would also be one of my favorites. brilliant kid that kicks trash in every possible way. Top tens are fun! I haven't had time to participate lately in Top Ten Picks or to try Top Ten Tuesday for the first time. BUT, I had an earlier post on the category so I linked up-- hope that is ok. I love Rhett, Sirius, Dumbledore, Jo, and Elizabeth/Darcy on your list! Great list and great reasons for your choices. I think for each one I mentally either cheered your choice or added another book to my must read list! Great list. Although, we don't have any common favorites. Haha. Check out my list!